Yesterday I blogged about mini hosta gardens. Today I want to show you how you can move the mini gardens to containers. I made the container using a recycled styrofoam fish box (see May blog where I show you how to do this). 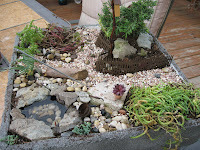 Then I added miniature plants (or hosta), which many times are found in the alpine garden section of nurseries. A nursery close to my area that specializes in fairy gardens and miniature gardening is Thistledown in Bonduel, WI. Then you can get creative and add all kinds of miniature accessories. I love the hens and chicks in the teensy terracotta pots! I have some of those small pots I bought knowing I could use them for SOMETHING - totally going to have to try that!